You may have heard that we enjoy the show Firefly. Well, on our way home from our vacation at The Paw House Inn, we stopped at a bookstore we love called Northshire Books. Since we were traveling, Harpo was with us. At first, KPD was holding the dog, and I had some time to help the Kid shop, use the bathroom, and pick out a new dress. (It’s organic and was handmade by women in Africa who are paid a living wage. How Vermont can you get?) Then I went in search of KPD, to find out what he was up to, and see if he needed me to hold Harpo for a while. I remembered that last year, KPD had spent a lot of time in one corner of the store, so I wandered in that direction. As I walked down the aisle, I saw an adorable, fuzzy face peering around a corner, looking for me. When I got there, KPD was browsing sci fi, and there was a deep, leather couch nearby, so I took Harpo’s leash and decided to hang out on the couch and wait for KPD. Then I looked at the windowsill behind me, and I saw it. Addiction in a box. Shiny! Since then, I’ve been addicted. Fifteen dice make a lovely racket when you shake them in a cup. 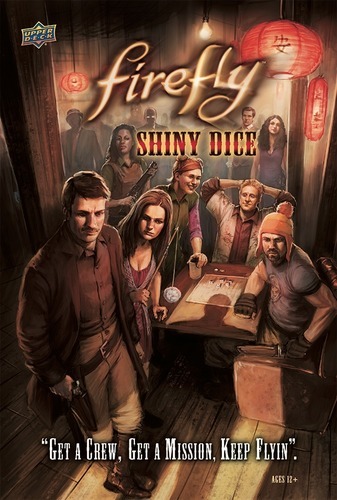 The game is well-designed, making you love Kaylee and River even more than you did, while realizing that Wash is handy to have around and Mal is a bit of a loser, if a charming loser. And of course it’s fun to make the dice kiss each other when you roll Kaylee and Simon together. Okay, if you do that, your daughter will roll her eyes at you. But other than that, it’s a great game. More, please!